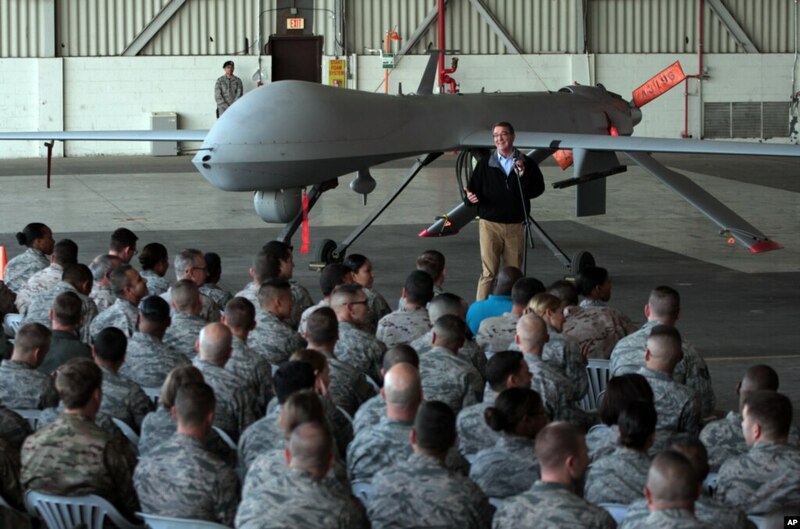 FILE - U.S. Defense Secretary Ash Carter addresses the U.S. troops as he stands in front of a drone at the Incirlik Air Base near Adana, Turkey, Dec. 15, 2015. WASHINGTON— When an Iraqi soldier heard a buzzing sound overhead last month in Iraq’s Anbar province, he took aim and shot down what looked like a bird-sized model plane. 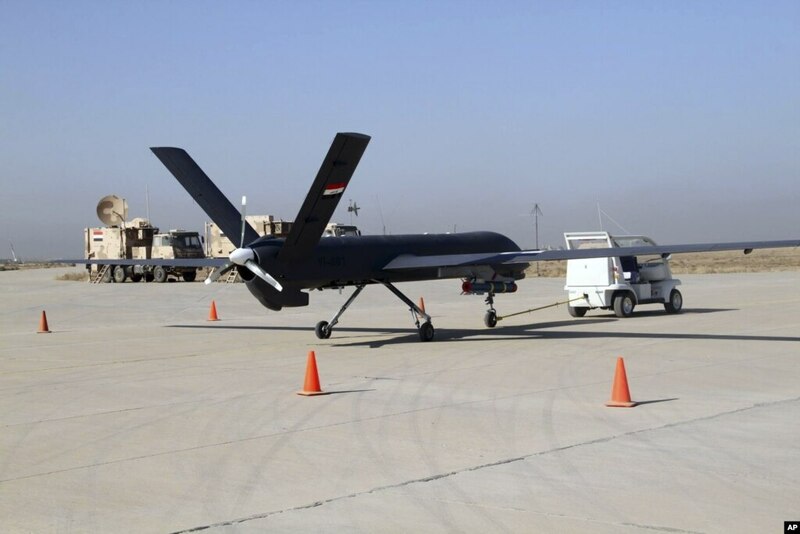 After studying the device, Iraq’s Ministry of Defense said it was a surveillance drone available for purchase on the Internet for less than $1,000 that was being flown by the Islamic State (IS) group. “The brave warrior ... was able to hit a spying plane belonging to the gangs of IS,” the ministry said in a Facebook post. Such incidents are becoming increasingly common in both Iraq and Syria. Drones from at least seven nations – and several militias and military forces including IS – are crowding the skies above Iraq, Syria and Turkey, according to interviews with analysts and officials in the region. FILE - A female Kurdistan Workers Party (PKK) fighter waits for a drone to land, in Sinjar, March 11, 2015. The drone had flown to check enemy positions near a site which had been hit by two Islamic State car bombs. “Drones [have] opened new aspects to the wars and changed the shape of the battlefields, making the confrontations more complicated and more sophisticated,” said retired U.S. Army Col. Robert Cassidy, who is studying their proliferation. The drones being used in Iraq and Syria range from state-of-the-art military hardware used by the U.S.-led coalition to rudimentary consumer products used by IS and various militias. Turkey, Syria, Iran, Russia, the U.S., Britain and Iraq all have used drones in the region. 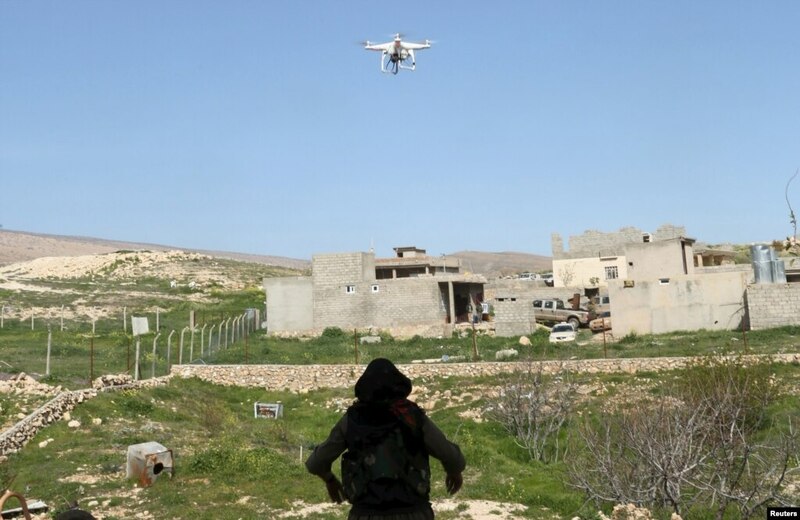 Kurdish militias, Syrian rebel forces, and the Hezbollah and IS have also used some form of drones. Their missions range from simple surveillance to precisely targeted assassinations of key terrorists by the U.S.-led coalition. While the Pentagon tries to keep its drone program covert, it has admitted several times in recent months to striking specific IS targets with drones, according to news reports. Among the targets was Islamic State's Jihadi John, who was shown in gruesome videos beheading U.S. and Western hostages. The drone program, which is run by the CIA and the Joint Special Operation Command, largely operates out of a Turkish military base. Britain has joined in the drone operation, according to published reports, and Turkey announced that its forces used four U.S.-made drones in a May 1 attack against IS. The Pentagon refused a request from VOA to discuss specifics of its drone program, which has grown in scope since its initial mission targeting terror suspects in Pakistan and Yemen. The widening U.S. use of drones has drawn criticism from human rights groups, some in Congress and foreign powers. FILE - The first drone to be used by the Iraqi Air Force, loaded with ordnance, prepares to take-off to raid Islamic State group positions at an airbase in Kut, 160 kilometers southeast of Baghdad, Iraq, Oct 10, 2015. In Syria, IS has responded with countermeasures, including blanketing rooftops and alleys in its de facto capital, Raqqa, with cloth and burlap. The extremist group has also flooded the Internet with names and addresses of several U.S. military personnel who are involved in drone operations. Unlike other jihadi groups, IS has proven itself technology savvy. It uses makeshift drones to gather information about its enemies and to produce aerial footage for propaganda videos. During the battle of Kobani in 2014, IS released drone footage that purportedly showed its fighters engaged in suicide attacks. Military officials say IS has increasingly flown spy drones near the bases of Iraqi and Kurdish forces. “We can clearly see IS drones flying over our front lines to collect intelligence,” said Qadir Qadir, a Kurdish peshmerga commander. Qadir said drone traffic has become so heavy that military commanders report difficulty in distinguishing IS drones from Kurdish and coalition drones. “Sometimes they are too high for us to reach or we’re not sure if they belong to our friends or to enemies," he said. Experts say IS has developed its drone arsenal from kits and parts found on the Internet. There are several IS drone factories near the Iraqi city of Mosul, according to news reports. Iraqi forces, which have been fighting IS since mid-2014, say they too use drones. “They are particularly helpful to obtain information on (IS) bases,” Lt.-Gen. Anwar Hama Amin, the commander of Iraqi Air Force, told VOA. Several reports say Iraq has purchased some of its drones from Iran, which supports the Shi’ite-led government in Baghdad. 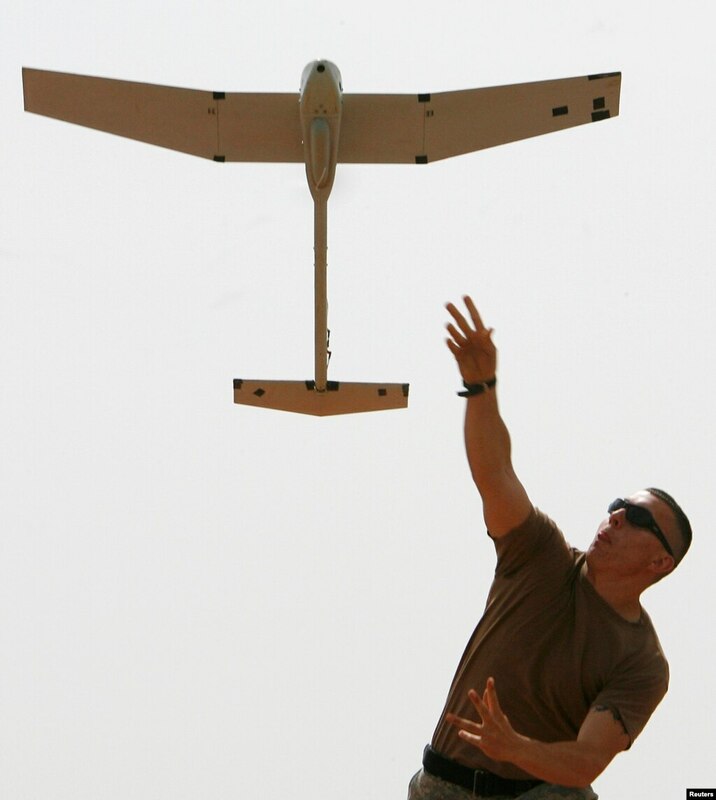 FILE - A soldier with the U.S. Army's 10th Mountain Division launches a remote controlled Raven observation drone from a military base in Mahmudiya, south of Baghdad, April 28, 2007. Amin denied using Iranian drones, said Iraq buys most of its devices from China and some from the United States. “The ones from the U.S. are only for surveillance purposes, but we use the Chinese drones to hit IS targets,” he said. The commander said drones have proliferated because they are inexpensive and fairly easy to assemble. “You can buy the pieces in the market and find their designs on the Internet,” he said. Kurdish forces, who fight IS in northern Iraq, say they use drones to gather information on IS. Iraqi Kurds use their drones in coordination with the U.S.-led coalition, Mirkhan said. “We use them in every front line, but I can’t say their exact numbers,” he said. Syrian skies similarly are swarming with drones belonging to various factions in the 5-year-old civil war, military analysts say. Russia entered the war with military aircraft in September, providing the forces of Syrian President Bashar al-Assad with added firepower in their fight against anti-government rebels and IS. Iran also uses drones to help the Syrian regime. The powerful Iranian Revolutionary Guard Corps (IRGC) announced in February that a Shahed 129, an Iranian-developed unmanned aerial vehicle, was providing combat support to pro-government forces in Syria. “Iran has invested tremendously in drone technology in the past decade,” said Sajjad Jafari, an Iranian drone specialist who is based in Tehran, told VOA. "Iranian drones have helped Syrian government in its war against IS." Iranian drones have been spotted by satellite imagery in several Syrian military bases, including air bases in Damascus and Hama. The Lebanese Shi’ite group Hezbollah, which is fighting alongside the Iranians in support of the Assad government, has also used drones. Hezbollah’s al-Manar television’ has broadcast footage of what it said was a drone attack near the Syria-Lebanon border. IHS Janes, a military analysis company, said the group has been using an abandoned Lebanese airbase near the Syria borders as a launch pad for unmanned aircraft. “Such support certainly boosts the [Syrian] regime’s momentum in the battlefield,” said Washington-based analyst Ahed al-Hendi who closely observes the patterns of war in Syria. But anti-Assad rebel groups such as the Army of Islam are also using drones. “They set advanced cameras on drones to be used for surveillance on opposing parties,” al-Hendi said. Turkey, reeling from the spillover of regional wars, is pouring millions of dollars into developing its own drone program for use against IS fighters in Syria and Iraq and Kurdish insurgents inside and outside of Turkey. 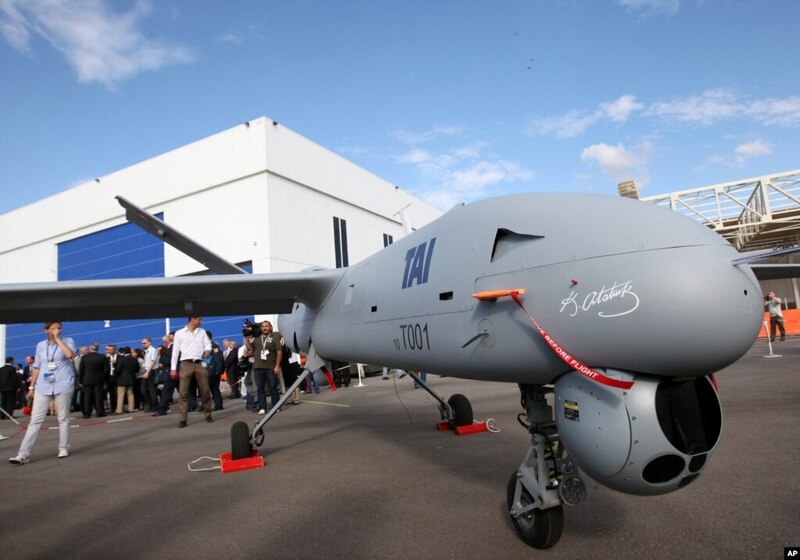 ​The Anka Block A, the largest drone that Turkey’s has produced, made its debut in February. A Turkish drone in April spotted two missile launchers in northern Aleppo in Syria, according to Hurriyet newspaper, which cited Turkish security sources. 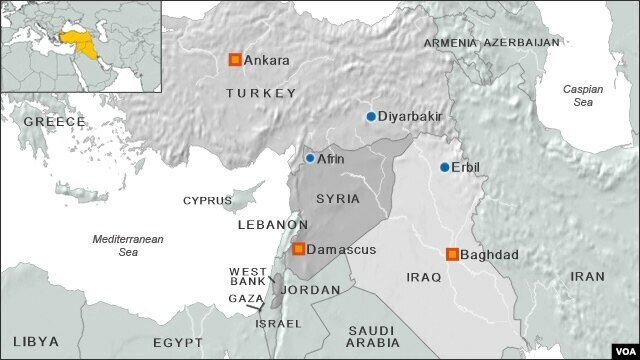 The Turkish military struck the IS positions with its howitzers, killing 13 IS militants and wounding seven others. Analysts said the Turkish military also uses drones against Kurdish militants of the Kurdistan Workers’ Party (PKK) inside Turkey, a move that is causing controversy among Turks as civilian casualties are mounting. “There are legal issues associated with [drone use], particularly over how decapitating strikes against citizens involved with the PKK are decided,” said Can Kasapoglu, a defense analyst at the Istanbul-based Centre for Economics and Foreign Policy Studies.